In 1977, Brown County and the US Army Corps of Engineers (Corps) executed a memorandum of agreement to construct the Renard Island Confined Disposal Facility (CDF) on a legislative lakebed granted by the State of Wisconsin to Brown County for disposal of material generated from annual maintenance dredging in the Green Bay Harbor and navigation channel. From 1978 to 1997, approximately 2.7 million cubic yards (CY) of dredged sediments were placed on the island which then remained uncapped for the next decade. In 2002, Brown County received funding from the Wisconsin Coastal Management Program (WCMP) to develop a Closure Plan for the island. Eventually, the County, the Corps and the Wisconsin Department of Natural Resources (WDNR) agreed to a final Closure Plan detailing the construction of a cover protecting human health and the environment; however, it did not address the final end uses for the island. Beginning in 2010, Brown County and the Corps began the process of closing the island and installing an engineered soil cap. As part of the closure process, the Corps built a causeway to access the island. In 2010, Brown County received a Great Lakes Restoration Initiative (GLRI) grant to move approximately 230,000 CY of capping material to Renard Island from the Bay Port Dredge Material Storage Facility. From 2011 to 2014, an additional 430,000 CY of clean dredged material was placed on the island as a final cap shaped to meet the requirements of the WDNR-Approved Closure Plan. In 2015, the WDNR approved the final cap and subsequently, in 2017, the Corps transferred ownership of the causeway and island to Brown County. Renard Island is one of the only areas in the Green Bay metropolitan area that provides direct access to the waters of the bay. With the transfer of ownership, the County is now looking at end-use options for the 55-acre island. In 2018, the County received a grant from the Wisconsin Coastal Management Program to complete an End-Use Plan for the island. In order to accomplish this, Brown County is working with a group of stakeholders to review and provide input for the plan and design process. The Renard Island Working Group is a group of stakeholders including Brown County, the City of Green Bay, WDNR, UWGB, adjacent landowners, agencies, and other interested individuals who have volunteered their time to review consultant materials and help advise the Brown County Port & Resource Recovery Department and the Harbor Commission throughout the Renard Island strategic planning process. The working group members have participated in regular meetings since 2016 and will continue to shepherd the process upon completion of the master plan through implementation of built projects. 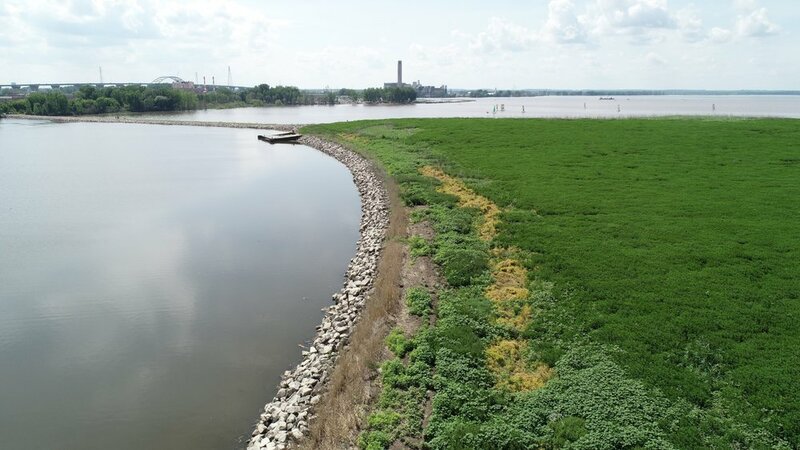 The Brown County Port and Resource Recovery Department has hired a team of design professionals to work with the community to envision the future of Renard Island. Throughout the fall of 2018, we invited interested individuals to contribute their thoughts and ideas for how the 55-acre man-made island can best serve the Green Bay region. The consultant team, led by SmithGroup and including Foth Environment & Infrastructure, Edgewater Resources, Applied Ecological Services, and Market & Feasibility Advisors, led a National Charrette Institute process for community engagement on civic planning projects. This included a series of public outreach events and a multi-day charrette with the public and stakeholders for this important piece of land. A Public Kick-Off meeting was held on October 2nd at the Neville Public Museum with more than 40 members of the public attending to provide their ideas and input on the future of Renard Island. 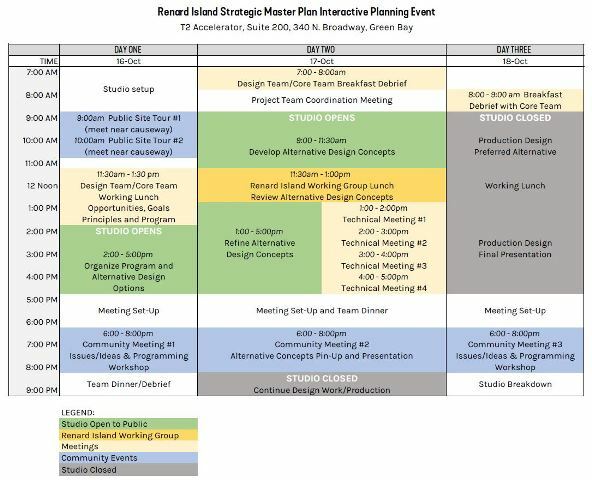 This three-day event included a series of workshops with stakeholders and the public to explore alternatives for the Renard Island End Use Plan. The consultant team worked each day to advance the plan and presented progress updates each evening at public workshops. Each day’s progress represented revisions based on the previous day’s feedback. A public workshop was held at 6:00 pm each night finishing with a presentation on the draft Master Plan on Thursday October 18. The team has assembled all the feedback they received over the three-day charrette event and created a Draft Master Plan representing a preferred land use plan for the island. This plan will be reviewed by the Renard Island Working Group and vetted by Port of Green Bay and County leaders to ensure it meets the goals and objectives set forth at the outset of the project. The consultant team will be conducting a market feasibility analysis, estimated capital and operating costs, construction feasibility and permitting analysis, funding opportunities, and other key considerations to set a clear path for implementation of the master plan.